Marenzoni ML, Lauzi S, Miglio A, et al. Comparison of three blood transfusion guidelines applied to 31 feline donors to minimise the risk of transfusion-transmissible infections. J Feline Med Surg. 2018;20(8):663-673. Questions remain regarding pathogen screening and test type for evaluation of transfusion-transmissible infections in feline blood donors. Recommendations for specific pathogen testing are based on country and each country’s different epidemiologic situation. This study examined differences between 3 veterinary transfusion guidelines (ie, Italian, European, and American; see Suggested Reading) and investigated how blood safety can be improved using tests recommended by these guidelines. All guidelines considered screening for FeLV, FIV, and Mycoplasma haemofelis infection to be essential, but it was found that following guidelines did not completely guarantee blood safety. Although clinically healthy, the 31 client-owned Italian cats enrolled in the study still had risk factors for harboring transfusion-transmissible infections, and some tested positive for some micro-organisms. All cats tested negative for FeLV and FIV via rapid test screening, and blood smears revealed no detectable microorganisms; however, PCR protocols revealed FeLV provirus in a cat and hemotropic mycoplasmas (ie, hemoplasmas) in 4 cats. FeLV infection in blood donor cats should be investigated using both serologic (eg, ELISA rapid screening tests) and biomolecular methods (eg, PCR). An experimental study demonstrated that naïve cats that received a transfusion of blood from aviremic provirus carriers—as in this study—developed active FeLV infections, some with progressive outcomes and development of fatal FeLV-associated disease.1 Based on the results of the present study, nested PCR testing for FeLV is recommended, as its sensitivity was 10-fold greater than that of the other PCR protocol for identification of FeLV provirus. Long-term carrier status can occur with feline hemotropic mycoplasma infection, and infected cats are often subclinical.2 Sensitivity of blood smear evaluation is too low for detection of hemotropic mycoplasma in chronically infected subclinical blood donors. For this reason, biomolecular methods (eg, PCR) are recommended for hemotropic mycoplasma evaluation. The full panel of transfusion-transmissible pathogens to be evaluated in a blood donor program depends on the epidemiologic situation of blood-borne pathogens in the area in which the donor cat lives and on the cat’s lifestyle and history of prophylaxis (eg, indoor vs outdoor, receipt of parasite preventives). 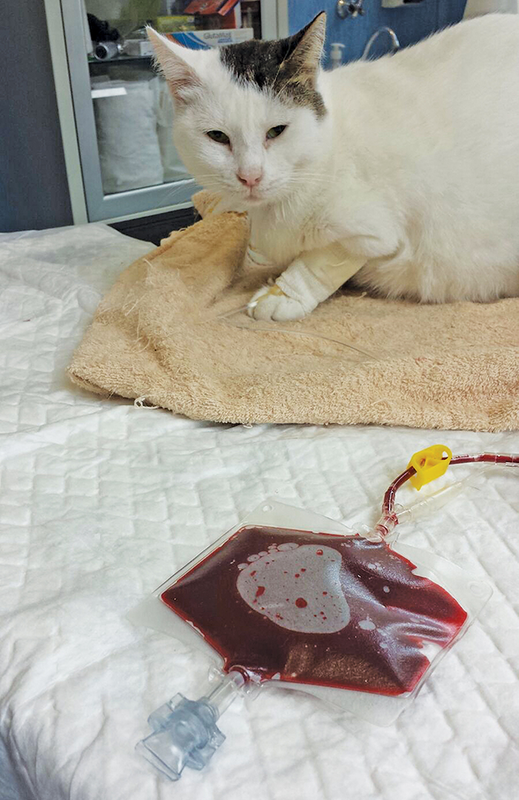 A minimum database for screening feline blood donors in an emergency situation includes a rapid test for FIV and FeLV infection and microscopic blood smear to identify potential blood-borne microorganisms (eg, hemotropic mycoplasma). In these cases, owners of recipient cats should give written consent following risk assessment. For routine feline blood donor evaluation, rapid diagnostic tools should be implemented with PCR examinations for FeLV and hemotropic mycoplasma. The most sensitive PCR protocols should be used. Nesina S, Helfer-Hungerbuehler AK, Riond B, et al. Retroviral DNA—the silent winner: blood transfusion containing latent feline leukemia provirus causes infection and disease in naïve recipient cats. Retrovirology. 2015;12:105. Tasker S. Haemotropic mycoplasmas: what’s their real significance in cats? J Feline Med Surg. 2010;12(5):369-381. Pennisi MG, Hartmann K, Addie DD, et al. Blood transfusion in cats: ABCD guidelines for minimising risks of infectious iatrogenic complications. J Feline Med Surg. 2015;17(7):588-593. Wardrop KJ, Birkenheuer A, Blais MC, et al. Update on canine and feline blood donor screening for blood-borne pathogens. J Vet Intern Med. 2016;30(1):15-35.